Are there any references to other Paramore music videos? 7. Are there any references to other Paramore music videos? 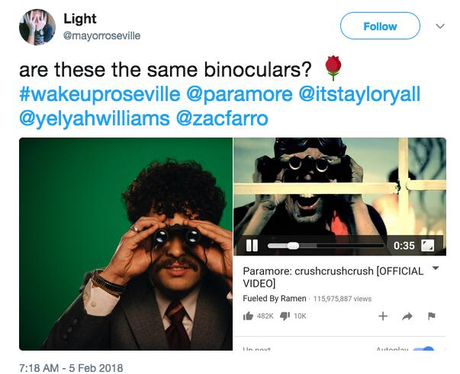 As well as the title of the book 'Real Happy' playing off the recent single 'Fake Happy', Twitter user @mayorroseville appeared to spot this connection with the 'Crush Crush Crush' video and the use of binoculars. No idea if they are the same pair but they certainly look very similar.